Belfast International Airport has extended its current contract with NATS, to supply tower services, to 2020. The two-year contract extension includes air navigation services provision and engineering services. This builds on the original contract, which came into effect on 1 April 2013 and was scheduled to run for five years. The next two years will see NATS supporting the airport operator in the delivery of some significant projects, including the replacement of the Instrument Landing System (ILS) and upgrades to the Semi-Automatic Metrological Observation System (SAMOS). 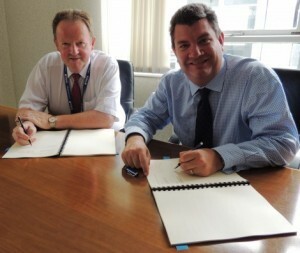 Photo caption: From left to right, Graham Keddie, Managing Director, Belfast International Airport and Martin Rolfe, NATS Chief Executive Officer sign the contract at Belfast International on 7 July 2015.